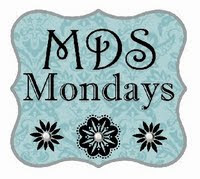 Craftin' Caro: MDS Monday -- celebrating with friends! MDS Monday -- celebrating with friends! I plan on spending the day finishing all the last of my holiday cards (1/2 way there!) -- I know I'm a little behind but that seems to be the theme of this past fall/winter. All the recent illnesses in the family from the past few months have just kept throwing me further and further behind schedule. Maybe I'll start new year's cards in March....? Anyhow, it's MDS Monday once again, and so today I'll share a page from the 2007 Stampin' Up! Panama Canal Cruise album I've been working on. This page uses the Black & White DSP with a light wash of Real Red (at 5% opacity) overtop. With a bit of a busy background, I didn't want the title to be placed right on top of the paper, but neither did I want it in a solid-coloured box. My compromise was once again to use the opacity tool: I created a long rectangular shape using the Square punch, filled it in with White at at 75% opacity. That way it acted almost like a very heavy vellum overlay. Oh, and about the photo? 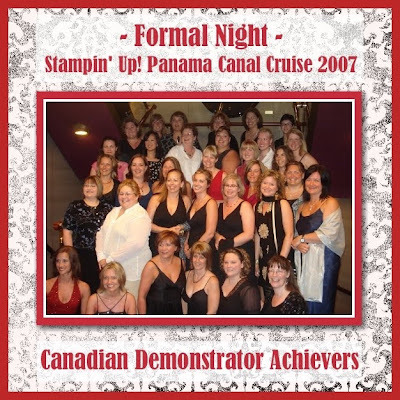 On the final formal night of the cruise, we tried to assemble my fellow Canadian cruisers together on the staircase outside the Dining Room for a group photo in all our finery. Don't we look lovely? OMG Carol....... that Trip brings back a lot of great memories !!! I REALLY miss Stampin Up !!! !